Forty six people left Brindle on Saturday, 27th June for a day trip to Chatsworth House in Derbyshire, the stately home of the Duke of Devonshire. The house has a Brindle connection, as it holds details of the Brindle Estate (the latter being owned for many years by relatives from the Cavendish branch of the family). Chatsworth dates back to around 1550 and has an estate covering 35,000 acres, although the surrounding park covers just 1,000 acres. Mary Queen of Scots was held at Chatsworth on a number of occasions during Elizabethan times and U.S. President, John F. Kennedy was a regular visitor (his sister married the eldest son of the 10th Duke in 1944). 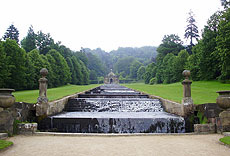 Passengers on the coach trip visited the house, gardens (including the fountains, waterfalls & cascades), the maze, the kitchen garden and farm shop. In the house some 25 rooms including the State rooms, Chapel, Library and Dining Room were on view. In one section was a display called ‘Chatsworth in Camera’, highlighting the role the house and estate has played in some modern feature films, including ‘The Duchess’ starring Keira Knightly. The day ended with a visit to the farm shop where a food festival was taking place (needless to say quite a few passengers carried carrier bags full of goodies back on to the coach). Thanks go to Chairman, Ian Whyte, and his wife Kathy for organising the day.